Measure from corner - marked A on the diagram - to the other front corner - marked B. Measure the total length of side C.
Add the measurements together - that is the LENGTH of the sheet you will need. This will allow plenty of cover to go to the door uprights at both ends and to reach down to the door header at each end. To find the WIDTH of the sheet you will need to consult the chart below. 1. 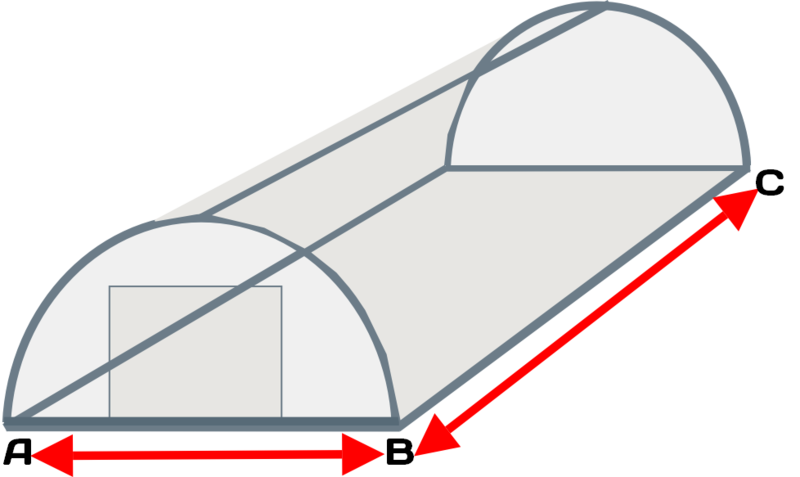 Decide how wide your tunnel is in either feet or metres and select that column. Where the fixing method and tunnel width column meet is the width of the sheet you will need. Choose your tunnel length from the left hand columns. Where the tunnel length row meets the sheet width column is the sheet length you will need.